Frlan families are Croats and they are mostly from the Island of Lastovo. 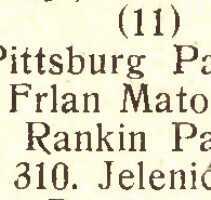 In the past century, relatively most of Croatian residents bearing this family name were born in Rijeka and Zagreb. In Vivodina in Ozalj every third inhabitant had the family name Frlan. About 320 people with faimily name Frlan live in Croatia today, in 140 households. There were 410 of them in the middle of the past century, and their number decreased by 20 percent. They are located in 9 Croatian counties, in 15 cities and 30 other places, mostly in Zagreb (45), Kastav (40), Rijeka (40), Matulji in Opatija area (20), and in Cavle in Rijeka area (20). At least four families with this surname emigrated from Croatia to: the United States (2), the United Kingdom (1), and to Germany (1). Family name Frlan is present in 20 countries worldwide. The family name "Frlan " is used by small number of people in the United States , small number in Canada , and small number of people in Australia. "Ferlan " is used by some 100 people in Indonesia , about 80 in the United States , and some 60 people in Italy.